Graeme McDowell plays on both the US PGA Tour and the European Tour. He shot to fame when he became the first European to win the US Open for forty years in 2010. He is also a seven-time winner on the European Tour and reached as high as four in the official World rankings. McDowell was a successful amateur in both Ireland and the United States. He was a member of the successful Great Britain and Ireland Walker Cup team in 2001 at Sea Island, Georgia and turned professional the following year. He did not have to wait long for his first victory on the European Tour, capturing the Volvo Scandinavian Masters on only his fourth start. His next victory came in 2004 with the Telecom Italia Open and he finished a highly respectable sixth on the European Tour's Order of Merit. In 2005 he played on both the European and U.S. PGA Tours and achieved two top-10 finishes in the States. He returned full-time to the European Tour in 2007 and returned to winning ways the following year in the Ballantine's Championship in South Korea. He followed up in the Barclays Scottish Open and earned a place in the 2008 Ryder Cup team. 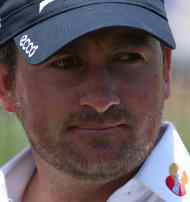 In 2010, McDowell claimed his fifth win on the European Tour in the Celtic Manor Wales Open but better was to follow with a shock victory at Pebble Beach in the US Open. He was the first European winner since Tony Jacklin in 1970 and the first winner of a major from the UK since Paul Lawrie’s Open triumph of 1999. That win catapulted him to number 13 in the world rankings. McDowell joined the PGA Tour following his famous win and earned a five-year exemption for winning a major. In October he took part in the Ryder Cup, having his five-foot putt conceded on the 17th green by Hunter Mahan to seal victory for Europe by a single point. He went on to win the Andalucía Valderrama Masters and finished runner-up to Martin Kaymer in the 2010 Race to Dubai standings. On December 5th, McDowell beat Tiger Woods in a playoff to finish his stellar year in perfect fashion and win the 2010 Chevron World Challenge. McDowell was not quite able to sustain that level of form in 2011 but finished third on four occasions. McDowell finished the year 16th in the Race to Dubai and only 73rd in the FedEx Cup standings despite earning over a million dollars on the PGA Tour. In March 2012, McDowell produced his best finish on the PGA Tour since his U.S. Open win when finishing runner-up to Tiger Woods at the Arnold Palmer Invitational. He carried that form into the US Masters where he finished in a tie for 12th after a final round of 68. In 2012, McDowell was beaten by one hole by Nicolas Colsaerts at the Volvo World Match Play Championship at the Finca Cortesin Golf Club. In June, he was tied for the lead with Jim Furyk going into the final round in the US Open. After a disappointing start to his round, he pulled back to within one shot with one hole to play but narrowly failed with a 25-foot putt on the final green that would have earned him a playoff with Webb Simpson. A month later, McDowell was again in contention at the 2012 Open Championship at Royal Lytham & St Annes. He started the final round four shots adrift of leader Adam Scott by four strokes but shot a poor 75 to drop back into a tie for fifth place. It still represented his best showing at the Open and offers encouragement for the future.